Home DIY Projects	Andirons to Upgrade Gas Logs! Happy Monday, friends! I have a quick DIY project for you. How do you make a set of gas logs look more authentic? 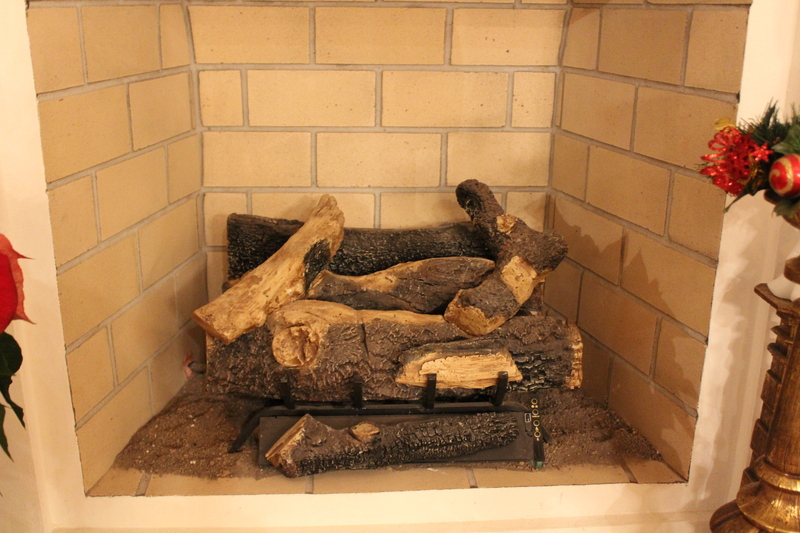 Come see the before and after pictures of andirons to upgrade gas logs! The gas logs in our new house leave a lot to be desired. Granted, I’m a bit biased since we had a great wood stove in our last house. (Pictured below.) It was a Fireplace Extraordinaire and boy, it really put out some heat! Not only was it pretty, but nothing beats the aroma and feel of a real fire. Lacey loved it too! When we put the house on the market I put a much-needed fresh coat of paint on the fireplace mantle. I think it was a selling feature. I admit I am a bit of a fireplace snob now. The gas logs in our new house are not vented and give off a strong gas smell when burning. Not only that, they don’t have a realistic feel. Our current budget doesn’t allow a big change right now. So, what to do? I decided to add a set of andirons a friend gave me years ago. The set is heavy and made of wrought iron. They are black with a gold finial at the top. And they have the perfect amount of rust lending a more authentic and aged feel. I slipped them behind the rack that holds the logs and instantly the gas logs look more substantial and realistic. If nothing else this simple fix makes me feel better about the current gas log situation. The plan is to eventually switch them out to a gas version of the Fireplace Extraordinaire or a wood stove with a gas igniter. My friend gave me the andirons years ago and they sat in storage until I had a plan for them. Similar sets can be found at antique stores, consignment stores or on Facebook Marketplace. (Or new, of course, at your local box store like Lowe’s or Home Depot.) Don’t you think it makes a big difference? In fact, the entire fireplace will get a makeover at some point. Maybe next winter? This is how the fireplace looks now. The facade on the front of the fireplace wall is made from what looks and feels to be plaster. Although it’s unique and interesting, we miss a mantle and a flat wall. It was odd this past Christmas not having a mantle to decorate! I had hoped to refurbish the fireplace and mantle this winter, but my husband decided to work on the outside of the lake house now instead. And, I tend to agree with him. It’s perfect weather for outdoor demolition. For now, I’m content with my mini-fireplace makeover. It’ll do! Front Porch Renovation at Happy Hill! How to Organize a Coat Closet for $10! Carved Frames FIY = frame-it-yourself!